The Atlas is a modern and well-equipped hotel in the central part of Golden Sands, just a short walk from the lively resort's centre. Newly built for Summer 2003, the hotel offers a spectacular range of on-site facilities, including outdoor and indoor swimming pools. 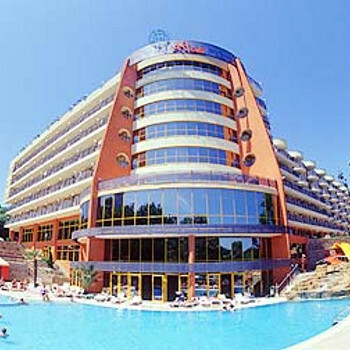 the bulgarian people i rate 1000%, nothing was to much bover.hotel good very clean, food 80%. my wife is disabled she can walk a little way with rests. position of hotel about 100+ mtrs above sea leavel, which means i was ok going down hill with the wheel chair but murder going up, my wife was able to walk a little way but a lot of disabled are not, so this is not the best hotel for disabled. the entertainment was absolute rubish. i would love to meet the bulgarian on a one to one together we would have a fantastic holiday. but the only thing that rearly spoilt the holiday is the fact that the germans out number the english by 100 to 1, they do not show you some of the hotel names because their is hotel germany and little germany, if you are german fantastic. would i go back only if i found a hotel and town where their are no germans. The hotel is now 3 years old, and the rooms are cleaned daily, though not necessary, as they are immaculate. The staff are friendly, as are the locals. The food is mainly pork or chicken based, and prepared to the German tastes, Germans being the major tourists in the hotel. This means that the meats are done to perfection, and come in a variety of styles. All delicious though. The location of the hotel is only a short walk from the beach, though it is uphill on the way back. A tractor/train runs from the seafront to all of the hotels at the back, and only costs 2 leva a person, about 60p. The bar staff have to be able to speak at least 3 languages, and get it right every time, putting up with a lot,in my opinion, of unnecessary critisism. The Animation team looked after the kids clubs and the 1 hour night shows, and worked very hard from morning till night. Overall, a good hotel, and a good resort. We were in this hotel at the same time last year and it was great. This year, the hotel itself was good but the food was TERRIBLE. I can only assume there may be new owners. We would go back again but would try self-catering. Again the room service was first class and the cleaner could not do enough for us. The entertainment during the day for the kids was just the same things repeated every few hours and seemed to be aimed at the European families kids. All in all the hotel is in a great location and is ideal to use as a base for a holiday. The hotel is very close to high street, but just far away enough not to be disturbed by it. with a 2 minute walk down a little slop you are in the centre of the main action area. It is about a 10 minute walk to the beach, its location is perfect. Unless you get up at 6am don't even try to get a sun bed by the pool!!! The hotel its self is lovely, it is so clean and when you walk around you constantly see maids cleaning areas, such as lifts, reception area, rooms. they are quite flexible about the time they clean your room and are willing to work around you. The spa area is very nice, offering massages and all sorts. the staff are nice, they are eager to please. their english is reasonable good. The catering staff speak limited english but reception staff always understood. Breakfast time was a nightmare, the best time to go was the last half hour. Otherwise it is a free for all, there is an ok selection of food, always some hot food too, but people fighting to get to it, mainly german people. The dinners are excellent, not as busy if you go down late and loads left. There is a barbeque, hot food and loads of cold food. Not for you if you are boring and only want chips! There was only entertainment there one night, but can't really comment as we were out everynight so didn't see it. There seems to be loads to do for kids. like clubs and productions. If getting a taxi get it through the hotel, very nice drivers. Very Nice hotel! This hotel is really great. Everywhere was clean, the staff very helpful and friendly and the food great and very varied. The restaraunt does get rather busy at peak times but you can always find a table. The entertainment staff really tried hard to keep the kids occupied and did really well with the junior disco! I would have no problem with staying in this hotel again! First and last time we will ever visit Bulgaria the hotel was very clean and thats it. The food was a disgrace, the staff were more interested in chatting among themselves than cooking food and not helpful at all oh unless you were dishing out the lev's. We have traveled all over the world and never experienced a country like this. We ate most of our food at local restaurants rather than in the hotel even though we were half board it was THAT bad. First time we were wishing for the week to end and get home and the hotel was classed as a 4* last year and now its a 3* that speaks volumes. Stayed at Atlas last week in June, first week July. Cleanest hotel we have ever been in with cleaners about 24 hours. Reception staffed 24 hours and the bar also. Food in the dining room was pretty good with the chef's only cooking a little at a time meaning it was pretty hot when you got it, but que's formed if a large group tried to eat at the same time. The buffet system meant you could eat as much of what you liked. Only drawback seemed to be German diners seemed to think everyone was standing in line just for them to push in when they saw the hot food being put in the serving dishes, although a quick pointing out of the rules put most of them right. Staff in the dining areas were always very helpful. The location of the hotel was pretty all right, with the main shopping areas a few minutes walk from the rear exit path. A few minutes more and you were at the beach. Room cleaning was great with the maids never pushing to get your room done at a certain time, thus you could lounge in bed half a day or be out of the room at 7.00am if you wanted. Didn't hang about many nights for the entertainment but there were shows on a few nights with singers and d.j.'s. During the day the kid's were well looked after by a good crew of entertainers. As guests from neighbouring hotels have access to the pool area it gets very crowded so bag a lounger at breakfast time, although in our 2 weeks we always managed to get a couple of loungers a little bit from the pool without too much trouble. The hotel was exceptionally good, cleanliness outstanding and the cleanest we have ever stayed in. The staff were very helpful and friendly, always willing to help when approached. Hotel food was varied, however only complaint was that on occasions the meat was undercooked. My 12year old daughter found the food too sophisticated for her taste. Not enough entertainment in the evenings although plenty to do during the day. We would definately visit this hotel again and have no hesitation in recommending to family and friends. Location excellent,there were plenty of pubs, clubs and resturants near. The two rooms that we had were really spacious and 4 people could easily have slept in them. The bathroom was large with a walk in shower. All areas of the Atlas are vey clean and the cleaners are always around sweeping up. If a leaf drops off as tree they are sweeping it up just after it has landed. The rooms are very clean with a change of towel every day. There was plenty of food both at Breakfast and Dinner and whilst in the second week it got a bit monotonous it was alweays hot and edible. Some of the staff do not always acknowledge you initially but if you smile and speak they are great and will try to talk to you and are helpful. The two pools are probably not large enough and the sunbeds seem to get taken up very early, but this did not bother us at all as we went to the beach most days. The beach is only about 10 minutes away even if you walk slowly. Well my first visit to Bulgaria . The hotel looks impressive and i have read the comments on this forum and i can tell you that, the hotel should never make 4* The Hotel is very clean and staff are what i could call laid back (ie in some cases horizontal), However everyone i spoke to all was suffering from a sickness and diahorea, and considering outside they charge .50 of a lev i suggest you take plenty of change with you ! As far as the food is concerned,well all i can say is if you want to go on a diet dont choose the atkins diet choose the hotel atlas diet it is guaranteed to make you loose weight one way or another And beware of the bugs ( no not mosquittos nor coackroaches nor timeshare reps ) The ladies of the night they are everywhere. Would i go back to this resort i ask myself ? well all i can say if England win the world cup and score 10 goals against Germany and Elvis comes back as the pope i might go back !